The DuraBox DBX Series dropbox works inline with your duct work to remove larger particulate from the air stream. Upon entering the dropbox, the airstream slows as it encounters a deflector plate. 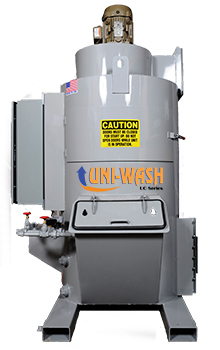 The larger particles drop into the hopper and collection bin and only the smallest dust particles are allowed to continue through the duct work into the dust collector. Utilization of the drop out box decreases the load on the filters of the primary dust collector and, in-turn, increases longevity. The ProVent DuraBox DBX is popular due to its ease of installation and its ability to be added to existing dust collection systems. Call us today to find out more about how the ProVent DuraBox DBX can be used in your facility: 800-610-6010 or feel free to use our Contact Page we will be sure to respond promptly. 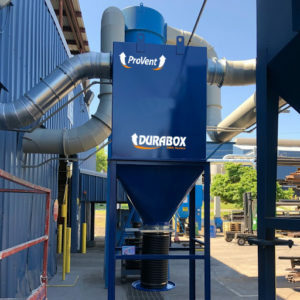 The DuraBox DBX is excellent for any dry dust collection system that has heavy loading or large particulate that tends to load filters quickly.